Shipwrecks at Orford ness nowadays are few and far between. 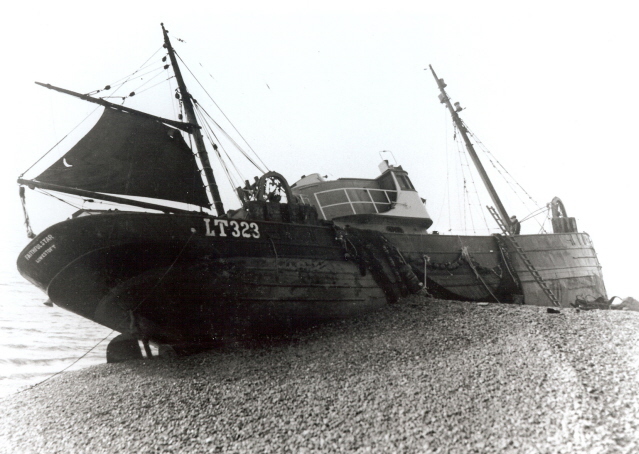 On the 12th February 1954 the collier, SS Kentbrook, came ashore about half way between the lighthouse and Aldeburgh. It came ashore on a very high spring tide and proved impossible to refloat. The hulk remained until the Cobra Mist installation was built, when everything made of metal in the immediate area had to be removed. It was then cut up for scrap and carted away. The Faithful Star was built in 1927 as a steam drifter-trawler, served during the war as a unit of the Auxiliary Patrol being released in 1946. In 1952/3 she was converted to diesel by Richards and L.B.S. of Lowestoft and had a 3 cylinder Podd diesel engine installed. A tug, the Richard Lee Barber was engaged to pull the Faithful Star off but on her way down she was diverted to pick up a barge, which was adrift and towed her into Harwich. By the time she got back the Faithful Star had been driven too far up the beach and could not be pulled off. Over the years since then, after being pounded by numerous storms the Faithful Star has nearly disappeared but some of her remains can still be seen at certain states of wind and tide. In addition to the skipper, George Challis, the rest of the crew aboard that night were, the mate Jack Bessey, 3rd hand Robert Norman, chief engineer Charles O'Neill, 2nd engineer Eric Burwood, deckies Stanley Humphreys and Kenneth Womack and the cook Frank Webb of Norwich. In 1979 the 200-ton coaster Queenford was on passage from France to Mistley with a cargo of sheet steel when she developed a 30-degree list. Two crew members were lifted off by helicopter but the captain, Keith March, stayed on board until it came ashore about half a mile South of the ill-fated Faithful Star. The Subro Viking, a sister ship, tried to pull the Queenford off but went ashore for a short time herself in attempting to do so. After an unsuccessful attempt to pull her off by a tug, the cargo was transferred to the 200 ton Glass Island and she was eventually refloated. A Norfolk Broads cruiser was on passage from Great Yarmouth to London in 1973 when it came ashore with engine trouble a few hundred yards South of the Lighthouse. The people on board were ill equipped for emergencies and before it could be refloated it was battered by an onshore gale, broken up and strewn along the beach like match wood. A 20 ft motor cruiser the "Tern" came ashore about a quarter of a mile North of the Lighthouse on the 26th May 1974 again with engine trouble. The owner was Mr V Heudebourck, with him on board were Mr R.B.Wood and Mrs L Galbraith. They were on route from Gorleston to Southend. They walked to the lighthouse and broke a window in the dwelling to gain access in order to use the telephone to summon help. 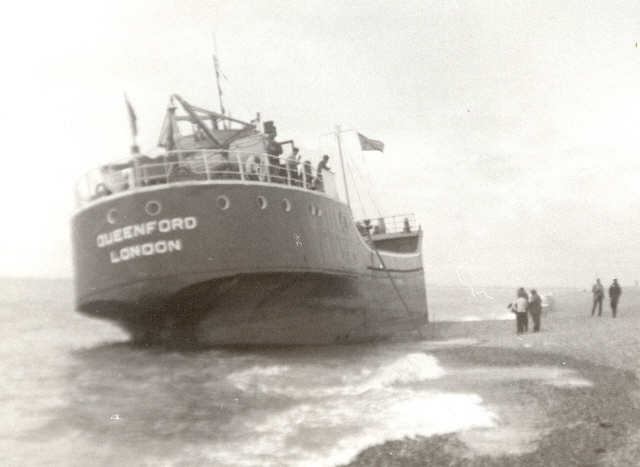 The "Tern" was later refloated and towed to Orford Quay by the harbour master, Mr Ralph Brinkley. A Dutch yacht was pulled off the beach more recently, again by the harbour master and towed to Orford Quay after being blown ashore by rough weather whilst on passage from Holland to Harwich. Whilst Orford Ness has been the scene of several ship wrecks, there has been times when it has been a very welcome stretch of shingle. The forced landing of the Italian fighter aircraft in 1940 has already been mentioned. More recently, in 1951, a United States Air Force, North American Sabre jet from the Bentwaters air base had engine failure over the sea but the pilot managed to make a forced landing on the shingle beach opposite Havergate Island. Apart from a minor back injury the pilot was alright and the aircraft was later recovered. In October 1979 a number of Wessex 5 helicopters from No 707 Squadron based at the Royal Naval Air Station, Yeovilton, Somerset had been detached to Valkenberg, Holland on an exercise mainly for trainee pilots to gain experience in foreign navigation. On the 8th October, after being delayed for a time by bad weather, they took off just after lunch for the journey back to Yeovilton via R.A.F. Manston for customs clearance. In one of the aircraft, (call sign WHISKEY UNIFORM) were the pilot Lieutenant Commander P Sall and a trainee pilot. In the back of the aircraft were a number of Petty Officers and Ratings including Leading Wren Aircraft Mechanic Janet Keohane who now tells what happened. "The weather was awful and as I recall we were flying above cloud. The flight started off in the same way as many others I had been on and it was my turn to listen in on the aircraft radio. We had been flying for what seemed like a fair while when the aircraft began to vibrate violently. I heard over the radio that Lieutenant Commander Sall had taken over the controls and was trying to find a break in the clouds and continue at a lower altitude, also that some of the instruments were no longer operational. At this point I decided that I did not want to hear any more and so disconnected my headset. In the back of the aircraft not only could we feel the vibration but could see the effects of it. The cabin windows are jettisonable but now they were flexing so much they nearly popped out. The pilot must have found a gap in the clouds because we descended very rapidly. The air crewman was obviously becoming anxious as he positioned the life-raft in readiness at the cabin door. The rest of us took up crash positions, one hand holding the seat between our legs and the other holding the escape rail behind our heads. All we could see from the aircraft was shipping flashing past and we appeared to be skimming just above the water. In fact 1 do not think any of us in the back, except the air crewman, knew what was going on. After what seemed like an eternity the air crewman's face broke into a broad grin and the aircraft began to descend even further. Through the mist and fog we could just make out a piece of land and thankfully the pilot brought us safely down on to the best shingle beach we had ever seen! An area we now know as Orford Ness! Janet Keohane went on to say how they drank the aircraftman's thermos of black coffee laced with some of their duty frees to steady their nerves and were then picked up by another aircraft in the flight and were flown to the U.S.A.F. base at Bentwaters before returning to Yeovilton the following day. A team from the Mobile Aircraft Recovery and Salvage Unit based at H.M.S. Daedalus, Lee-on-Solent, Hampshire arrived to recover the aircraft and lived in the lighthouse dwelling while the work was carried out. Because the helicopter was in an inaccessible position the help of the United States Air Force was sought and "WHISKEY UNIFORM" was lifted off by a Jolly Green Giant helicopter on the 11th October 1979 and taken to the Woodbridge base of the U.S.A.F. where it was loaded onto an articulated truck and returned to the Royal Naval Air Station, Yeovilton. The massive vibration had caused considerable damage to instruments and had made the radio unserviceable. The cause was found to be a thin strip of metal on the leading edge of one of the tail rota blades that had become detached. "WHISKEY UNIFORM" was repaired and returned to 707 Squadron to continue in service. The lights at Orford Ness have a long and varied history, as indeed has Orford Ness itself with its long history of experimental and secret work which has been briefly mentioned throughout "The Great Light". Another chapter in this long history started in 1993 with the takeover of Orford Ness by the National Trust and for the first time for many years the public are able to access to this unique site. The following account of the Queenford incident was very kindly sent to me by Charles Walker. I would like to thank him for allowing me to include this on my website. I am the Station Officer at Aldeburgh Coastguard. I knew your father Charlie very well as I often used to meet him at Orfordness Light when I was patrolling Orfordness. I would like to correct some information on the stranding of the Queenford, an incident that I attended. The crew of the Queenford were taken off by Harwich Lifeboat, leaving the skipper on board to try and steer her to safety. In the vicinity of the Whiting Bank, her cargo of sheet steel shifted some more and the list increased. I was in Aldeburgh Coastguard Station listening to the radio when the skipper of the Queenford suddenly called Harwich Lifeboat, which escorting the Queenford, and asked to be taken off. This was done very quickly and Harwich Lifeboat reported to Thames Coastguard that the Queenford was steaming at about 3 knots with no one onboard and was about to cross the Whiting Bank. There was a heavy sea running and no one expected the Queenford to survive the Whiting Bank. Early the following morning while it was still dark, a report was received that their was a ship ashore on Orfordness and a team from Aldeburgh, including myself, was despatched to investigate. We crossed the river from the Quay and walked across the Ness and crossed Stony Ditch on the last bridge. As we passed the pagodas we could see the ship was high and dry but still had it's engine running. We forced are way through the wire fence, it was still dark, and made our way to the ship. It was the Queenford. By standing on my colleagues shoulders I was able to board the ship. I found a ladder in the focsle and the rest of the team was able to board. We searched the ship and found it deserted. Alarms were sounding on the bridge as the engine was beginning to overheating. In the engine room we found the emergency stop button and we were able to stop the engine which was in imminent danger of seizing up. As the sun rose we were able to see that we had forced our way through the only bit of fence still standing, if we had gone 100 yards either way we could have walked round the standing piece of fence. As we looked over the stern we looked down on the remains of the Faithful Star. If the Queenford had come ashore 10 yards further north she would have sat right on the wreck of the Faithful Star and been severely damaged. I always remember walking back across the Ness and meeting the ownwers represenatives coming the other way. They hardly bothered to say Good Morning and we recieved no thanks for saving the engine.